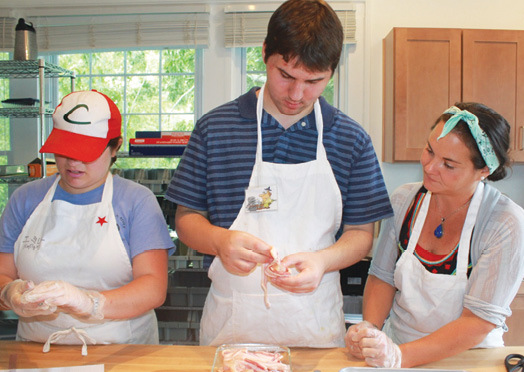 Last year, the crew at St. Gerard House in Hendersonville—an autism support and treatment center—cooked up something special for WNC teens and young adults on the spectrum: a 10-week culinary course. But although participants began working with therapists and local chefs in borrowed space in the fall of 2015, the idea truly came to life this summer, when a grant from the Community Foundation of Henderson County allowed the nonprofit to outfit a teaching kitchen at its campus. The classes are part of St. Gerard’s larger Feed the Need program, pre-vocational training that helps individuals prepare for, find, and retain meaningful employment through experiences in the art studio, garden, and now, kitchen. “The program is centered around improving social skills,” explains coordinator Julia Matthews—skills that transfer to applying for a job and understanding the dynamic of working as a team. In the kitchen, she says, relationship-building opportunities abound. The students come together each week to plan and make dinner, dine, and then share in cleanup. While some Feed the Need students go on to jobs in farming or food service, the intention is to prepare them for a wide array of positions. In addition to helping participants develop the broad social skills needed for employment, Matthews notes, the program boosts confidence to enter the workforce and teaches competencies like perseverance and time management—which prove useful both in a restaurant kitchen and when preparing a multi-course Thanksgiving meal for family and friends. Learn more about Feed the Need and St. Gerard House's programming for all ages, as well as support for family members, at stgerardhouse.org.